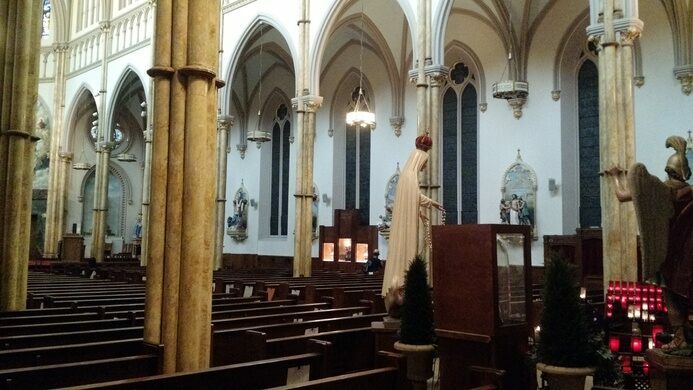 Church in Manhattan holds the bloody sock of Padre Pio, among with many other unusual relics. Within the Church of St. John the Baptist on 31st Street in Manhattan is a small, folksy shrine housing a bloody sock. This, along with a number of unusual relics, belonged to Padre Pio, an equally unusual 20th-century saint. Padre Pio (1887-1968) was a charismatic Capuchin priest who claimed a number of supernatural powers. He could read minds in the confessional and cure the incurable. He could be in two places at once, levitate, communicate with the dead, and tell the future. He had the odor of sanctity, a supernatural smell of roses that emanated from his body. Perhaps most famously he bore the stigmata, the wounds of Christ, which bloodied the glove and sock one can see in the shrine. Though he always had detractors, including a Vatican physician and neuropsychiatric scientist who called him “an ignorant and self-mutilating psychopath who exploited people’s credulity” he remained popular with several popes as well as the laity. Pope John Paul II canonized him in 2002 in front of a crowd of 300,000. On your way out, don’t miss the symbol of the Capuchins in gold on the door to the street – the bare arm of Christ crossed with the robed arm of the monk. You may recognize it from Santa Maria della Concezione die Cappuccini, the famous Capuchin crypt in Rome. Another of Padre Pio’s relics, a bloodstain from his “wound of the transverberation of the heart,” can be seen in St. John Cantius Church in Chicago. Hidden in an ordinary Midtown building is a one-room museum dedicated to the greatest escape artist.